After crossing the finish line in first place during a recent cross-country race, an Iowa runner was disqualified and stripped of his win for helping a rival runner who collapsed before finishing. And despite an outcry in the local community especially since this was the high school senior's last chance to win the upcoming state title race officials today stood by their decision. 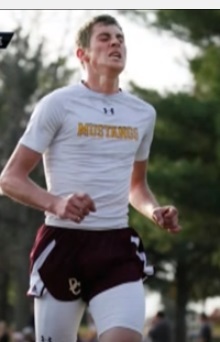 Zachary Hougland, 17, was walking to his team’s camp after crossing the finish line and earning the title of district champion, the first in Davis County High School’s history, when he saw Garret Hinson collapse, Davis County coach Josh Husted told ABC News today. "Zach saw him and shouted at other runners, 'Is anyone going to help him?'" he said. When no one stepped forward to help, Hougland put Hinson’s arm around him and lead him to the finish line during Thursday's race before letting go so Hinson, of Mediapolis High School, also in Iowa, could finish the race on his own, Husted said. "I thought about what it’d feel like if no one helped me," Hougland told ABC News today. "Even though he wasn’t on my team, I thought I’d show some good sportsmanship. I wasn’t thinking about how he was on another team or what officials would say about it." Although Hougland showed what Husted called "a lot of sportsmanship and character," he was disqualified for helping another runner. As a senior, it was Hougland’s last chance to earn a berth to race for the state championship, Husted said. Jared Chizek, assistant director of the Iowa High School Athletic Association, told ABC News that race officials follow National Federation of State High School Association (NFHS) rules. "NFHS rules do not allow a competitor to receive or give assistance from or to another competitor during a race," he said. "If a competitor receives or gives assistance, that competitor is disqualified from the event." Although Hougland was stripped of his win, he is still eligible to compete in the state meet as part of a team because his team qualified, Chizek added. Hougland’s mom, Nancy Hougland, said she was proud of her son. "Cross-country is a sport where in some of these places they’re kind of off by themselves so it’s nice to think that the kids have each other’s backs," she said, also saying she thinks the "rules need to be tweaked." To show appreciation for Hougland, the Mediapolis girls’ cross-country team, which made it to the state meet, made shirts in Davis County colors -- maroon and gold -- instead of their colors -- black and orange, Hinson's mom Kim Hinson told ABC News. "The back says something like 'He could've celebrated with his teammates but instead he chose to put his arm around me,'" she said. "And underneath the quote it has Garret and Zach's names."